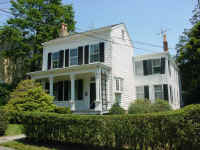 Welcome to the home page of the Mercer Hill Historic District Association, located in Princeton, New Jersey. Featured on this site are descriptions and photographs of the Mercer Hill Historic District, information about local topics concerning the District and the MHHDA's involvement with these issues. The Mercer Hill Historic District is a neighborhood of great architectural quality, composed primarily of mid-nineteenth century Federal and Greek Revival clapboard houses, many designed by the same architect, Charles Steadman. It is an arguably picture postcard perfect grouping of houses, reflecting in their architectural details the optimism and exuberance of our young democracy. The neighborhood is set between and embraced by the campuses of Princeton University and the Princeton Theological Seminary. Several religious and educational buildings as well as charitable foundations are located in the Mercer Hill Historic District. The neighborhood is included in the Princeton Historic District and listed in the National Register of Historic Places and the New Jersey Register of Historic Places. Two buildings in the historic district have been designated National Historic Landmarks. There are several noteworthy buildings located in the Mercer Hill Historic District. The Barracks (c.1696), located at 32 Edgehill Street, was where soldiers were quartered during the French and Indian Wars and possibly the Revolutionary War. It is perhaps the oldest house in Princeton. Morven (c.1750-1800), the home of Richard Stockton, a signer of the Declaration of Independence, is today a National Historic Landmark and operates as a history museum. The Princeton Theological Seminary is home to Alexander Hall, designed by John McComb, Jr. (1817), and Miller Chapel, designed by Charles Steadman (1833). Ivy Hall was designed by John Notman (1846) as a law school for Princeton University. It is located at 43 Mercer Street. Trinity Church was designed by Richard Upjohn (1868) and renovated by Ralph Adams Cram (1915). The Bonner Foundation (formerly the Sheldon House) at 10 Mercer Street, is a Greek Revival house with a temple portico which was moved to its present location by barge from Northhampton, Massachusetts in 1868. The Albert Einstein House at 112 Mercer Street was where the renowned physicist lived from 1936 until his death in 1955 and is now also a National Historic Landmark. In 1985 Princeton's Borough Council created the Mercer Hill Historic District in order to preserve the historic quality of the neighborhood and its buildings. The District is only a short walk from Princeton's business district centered on Nassau Street. Two of Princeton's main thoroughfares pass through the District: Mercer Street and Stockton Street. A third, University Place, forms one of its boundaries. As the area around Princeton has changed from open farmland to housing subdivisions and office parks, the automobile traffic through the District and the pressure to accommodate it with parking and street modifications has increased exponentially. There is also pressure from the businesses in the nearby commercial district which see Mercer Hill as a possible area for expansion. The Mercer Hill Historic District Association (MHHDA) was created in 1999 by residents of Princeton interested in maintaining and preserving the Historic District. It is dedicated to preserving and celebrating Princeton's diverse architectural heritage. Through its historic research, advocacy, and public education, the Mercer Hill Historic District Association works to ensure that Princeton's historically and culturally significant buildings, streetscapes, and neighborhoods remain a legacy that will be appreciated, enjoyed, and used by generations to come.